You will need a glass and spoon too. 1. 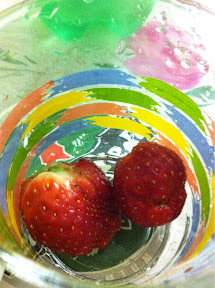 Pick one or two strawberries and put them in the glass. You can put more if u have bigger glass. 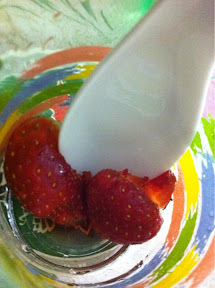 I picked two big one for a small glass because I would like to have stronger strawberry taste in my drink. 2. 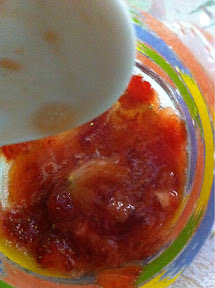 Smash the strawberries with a spoon. I know it's cruel to smash the pretty strawberries but you have to!! 4. 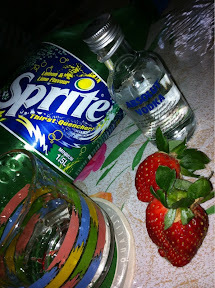 Add in suitable amount of Vodka (I use Absolut Vodka) in the glass, follow by Sprite. 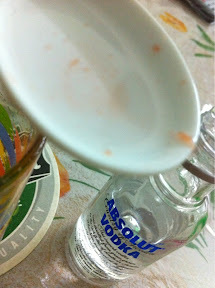 My recipe is Strawberry puree, Vodka, Sprite in 1:1:1 ratio. 5. 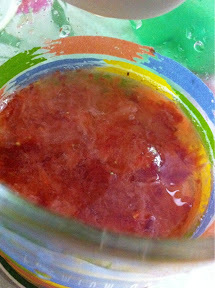 Stir everything together, add one or two ice cubes, DONE. It's very easy isn't it? I personally love vodka for homemade cocktail because I can add it in anything..
but can i use another alcohol~??? The Curve - Bubba Gump Shrimp Co.